Cuttack situated in the state of Odisha is one of the oldest cities of this place and also its commercial capital. The city is reputed all over the country for its exquisite and delicate filigree works, its artistic horn works and the fine and colourful textiles manufactured here. This is situated at about 30 Km from Bhubanewar.Cuttack was founded in 10th century by Nripati Keshari and it was the capital of Odisha under the British rule. It is also known for its Odishan handicraft items. It is situated in Canacona Taluka, in the south of Goa which is about 2 km from Poinguinim at a distance of about 10 km away from Canacona town. This ancient city of Odisha was built in 989 AD as a military cantonment by king Nrupa.It became very popular in 12th century during the socio-political scenario of India.During this period it was under the reign of Ganga Dynasty. The city is said to have been prosperous till it was captured by Firoz Shah Tughluq after which the city witnessed a brief period of vandalism, destruction and looting. The last Hindu king to rule Cuttack was Mukunda Deva and after his demise came an end to the Hindu kingdom in this place. After this history says that Cuttack went under the Muslims and then the Mughals. Dusshera is one of the major festivals celebrated in this aesthetic city.Dussehra is famous for its Chandi Medhas,during which the people or the localites decorate the idols of goddess Durga with lot of gold and silver and keep it in the streets for appreciation. This festival falls in the month of October or November and is celebrated for nine consecutive days. Baliyatra falls in the month of November on the banks of river Mahanadi.In olden times, merchants from Odisha used to trade with South-East Asian countries which was then kept for a sale in Cuttack for people to come and buy. So the same custom is still followed where people from all over Odisha come to the Baliyatra to buy items. Kite flying is celebrated along with Makar Sankranti in the month of January. People celebrate with great enthusiasm. Other festivals like Holi, Id, Good Friday, Rath Yatra, Diwali, Christmas and the numerous Hindu festivals are also celebrated here. 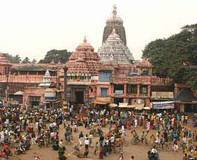 This is the most worshipped god in Cuttack and a very famous pilgrim destination for Hindus. 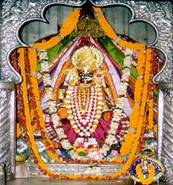 The temple is located south of Barabati area and is visited by many devotees everyday. 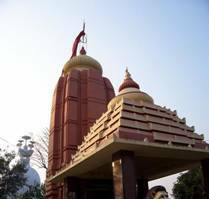 This temple on the outskirts of Cuttack is another tourist attraction. The diety worshipped here is Lord Shiva. This temple is known for the large water hole which is let out on holy days into the Sanctum Sanctorum. The Barabati Fort, dating back to medieval times, was once nine-storey high structure on the banks of Mahanadi River and now stands in ruins with only its moat and gate having survived the thrashes of time. All that remains of the Bara Bati Fort in Cuttack in India is an arched gateway and an earthen mound telling about the nine storied palace. According to Archeological surveys the fort spreads across 102 acres and was surrounded on all sides by laterite and sand stone walls. 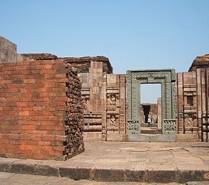 There was a tank to the west of the mound of Bara Bati Fort Cuttack and on the north eastern corner there was a temple. On the banks of river Mahanadi is the Stone Revetment famous for its engineering works in the 11th century itself. This is a place in Cuttack which should not be missed. The Qadam-i-Rasool Mosque was built in the 18th AD century by a Hindu ruler for the Muslims. It is housed with three mosques where the central one contains a stone with the footprints of Prophet Mohammed. This place which is about 37kms away from Cuttack is a small island with a Shiva Temple on a small hill-top. Ansupais known for its serene lake and is at a distance of about 70 km from the Cuttack city. It is a very good picnic spot with activities like fishing and boat rides. These are the three hill top complexes and seats of Buddhist monasteries and centers of learning and are situated at about 70 km away from Cuttack city. Choudwar which is situated at a distance of 10 kilometers from Cuttack. It has the ruinous remains of the eight Shiv Pithas established by the kings of the Keshari Dynasty. 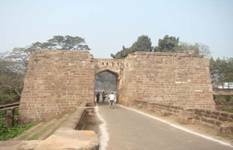 This historical important place was once the administrative capital of the Somakuli Keshari kings of Odisha. The shopping area of Cuttack is known for its handicrafts and textiles. The city is famous for its silver filigree work, which is used in making exquisite jewelry. The state emporiums have a wide collection of traditional fabrics, cotton and silk fabrics. The more famous item in the list of shopping in Cuttack includes brass and metal ware, fashionable ornaments made from brass and metal that are a favorite amongst the women. For men, there are the lovely brass made tiepins and cufflinks. The nearest airport to Cuttack is the Biju Patnaik Airport at about 30km in Bhubaneswar.It is catered by flights from all major cities of India. A taxi drive to the airport from Cuttack is about a half hour ride. Cuttack is well connected by rail route to all metro cities and other major cities of India like Delhi, Kolkata & Mumbai. Road network in and around Cuttack is pretty convenient. There are state owned as well as private operators who have their buses and luxury coaches plying to all nearby areas and to major destinations in Odisha.